Angel’s still on his mission to resurrect Giles, Nash and Pearl are locked in a battle with the vampire and the Slayer, and havoc is spreading. Sounds like another night in Merry Old England. The story alone would get me revved up, but this month we also get a spectacular cover that has me in love. The sight of Nash holding up the skeleton by its ribcage like it’s nothing, coupled with the gentleness of peacock feathers, just strikes the right balance of beauty and horror. Steve Morris did a fantastic job with the artwork. We start off this issue with Angel and Faith locked in battle with Nash and Pearl. The casual comment that Nash makes about having killed more than fifty Slayers so far strikes terror in such few words. But Faith is not going to be deterred by his threat and manages to gain the upper hand through some fast moves. If she and Angel can’t take the siblings out alone, she will enlist the entire crowd who is more interested in the fate of the Mohra blood. But Angel is not one to simply run out the door, lucky to be alive. Instead of retreating and planning a future attack against his former minions, he instead wants to find out what other secrets Fraser has been hiding. Down to the basement they go! And while Angel’s battling bodyguards, Faith’s having a debate with her conscience. Should she take the Mohra blood and end Angel’s insanity once and for all? One quick bash over the head and he’d be human again. It wouldn’t take much. Resolved that this is the best plan, she readies her arm and prepares to swing. But it will never be that easy. Her plan was thwarted before it began with Angel’s discovery of what was down in Fraser’s basement. The Mohra blood regenerates, but it doesn’t stop doing so. The destruction of the Seed has tainted its effects and all the people who took the blood afterwords have fallen victim to its mutant effects. There are monsters down in Fraser’s basement, all the missing people, and they’re in pain. Angel has sworn to help them, to find a way to end their suffering, and he does. A bloody round of beheadings later and all the victims are dead, mercy killings courtesy of Angel and Faith. With the Mohra blood no longer an option for Angel’s resurrection plan, they’re off to find another avenue to pursue. Well, Angel is. 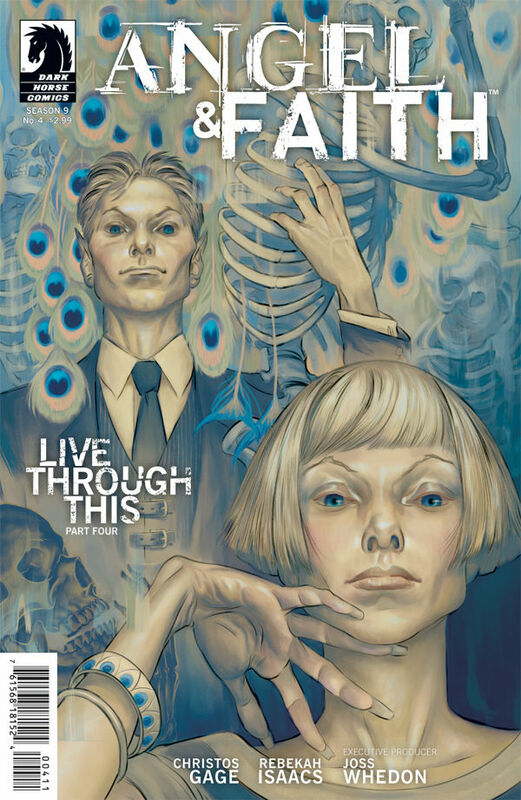 Faith’s just tagging along until he makes a wrong move and then she’ll have to resort to a mercy killing of her own. But it seems that where Angel’s avenue ended, Nash and Pearl’s has just begun. Teamed up with Whistler, they weren’t looking to deal out eternal life. They were instead seeking to provide eternal misery for their chosen victim. Who that is, we don’t know yet. And Faith finally confronts Angel about his plan and says that, while she has his back, she won’t hesitate to stop him if he crosses certain lines. And instead of an expected backlash from Angel, we got acceptance. He chose Faith specifically because she can keep him in check. Nice to see he hasn’t gone completely around the bend yet. Or maybe he has. The last scene of him channeling Giles makes me wonder if he hasn’t crossed a certain line already. I’m looking forward to finding out.